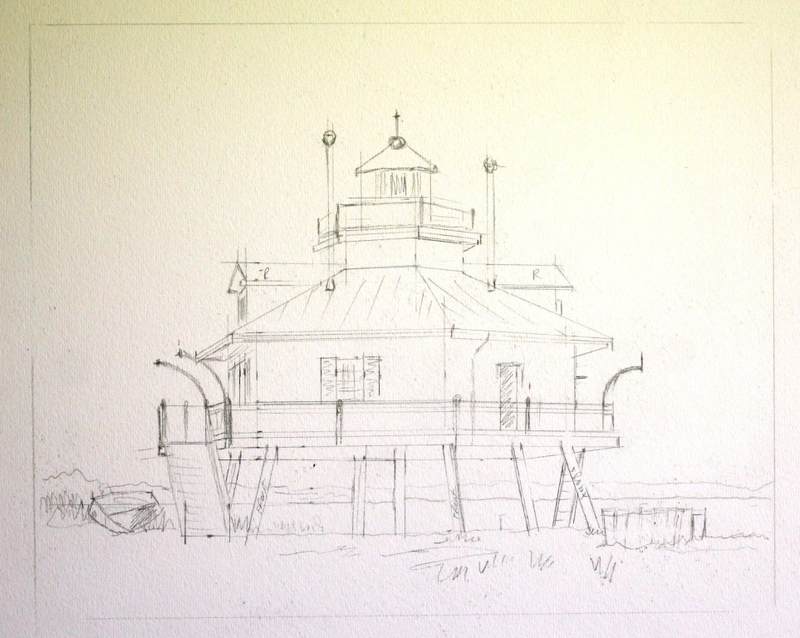 This next commission is for a smaller black and white drawing of a marine museum building. It is a six sided structure, set right on the water and boats can be docked right next to it. It is a little more complicated than most with its six sides. We looked at it from all vantage points and decided we liked this one the best. When looking in from the water side, it had a bell in an upper dormer, but I liked the stairwell and she did too. I kept the little dingy laying on the shore next to the museum for added visual interest. I wonder what those curved spars are for? Maybe they are boat lifts for hanging smaller vessels. Well, here are the two home portraits. I had to adjust the driveway on the second one as it wasn’t wide enough. I didn’t notice it when I was inking it up, but when I was comparing them in the last two posts it jumped out at me. Fortunately, it is easier to add black than take it away. They are quite similar as I hoped, but not exactly alike. I rather like them each on its own, which is what I hoped to accomplish. I’ll look at them again later today and make final adjustments, probably to the tree tops in Number Two. These should go into the mail tomorrow and then on to the next commission. It’s only black and white so it won’t take too long. Christmas purchasing seems to be starting early this year which is just fine with me. There is such a temptation, when doing a picture twice like this, to try and refer back to the original drawing and this was no exception. I had mostly finished the first one and decided to go ahead and start the second. The first one was sitting next to me on my rolling shelves, right at the edge of my vision and I kept having to avert my wandering eyes. While they have to look alike, there is no way they can be exactly alike. The foliages cannot be duplicated . Still, I want someone to be able to see differences only under close study. I don’t want one gift recipient to say “I like yours better than mine.” If I make too many references one to the other, it takes the spontaneity off of the second one. Basically the houses have to be very similar, but the landscaping can vary somewhat. I just want to be careful that the second one doesn’t look stale because I referred back to the first one too much. On to the pastels later today. The inking on the first of the two drawings is almost done. I need to do a bit more on the upper parts of the trees, balancing out the darker areas, and draw in the window curtains, but I didn’t quite get to it today. I’m going to let it sit and then finish the inking before I start on the next one. The whole process will take somewhat longer than normal but it is the way I feel most comfortable working on this project. The feel of this one is a bit different from other home portraits I’ve done. With the focus a bit farther out, it definitely has more of a neighborhood atmosphere. For such a simple house, this is not necessarily a bad thing. I once did a little brick ranch house that was up on a small hill with the viewpoint from slightly below. It enhanced the house , making it seem much grander than it really was. The pale yellowish siding on this will make this small structure a natural focal point amid all of the green foliage. The sidewalks will stay light too. 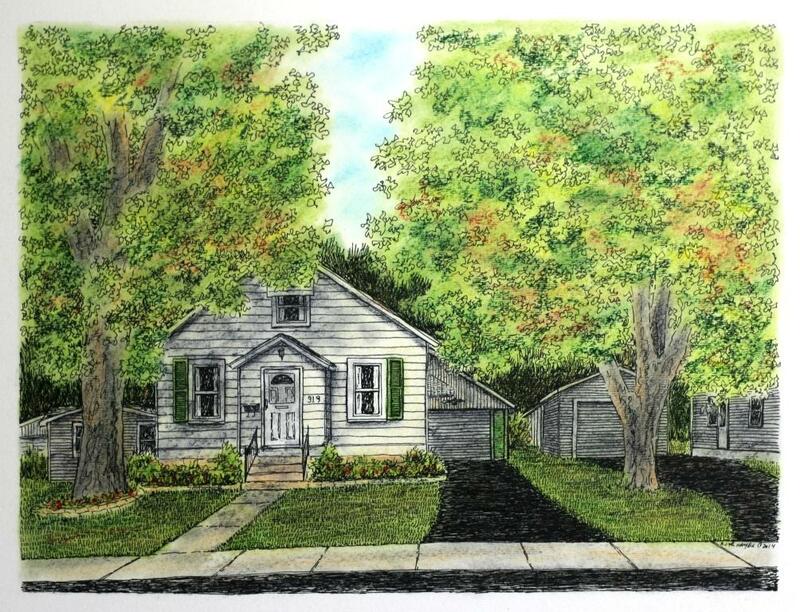 Next up on the board is an order for 2 drawings of a family house to be given as gifts. It’s not a first for me to make more than one drawing of a structure. 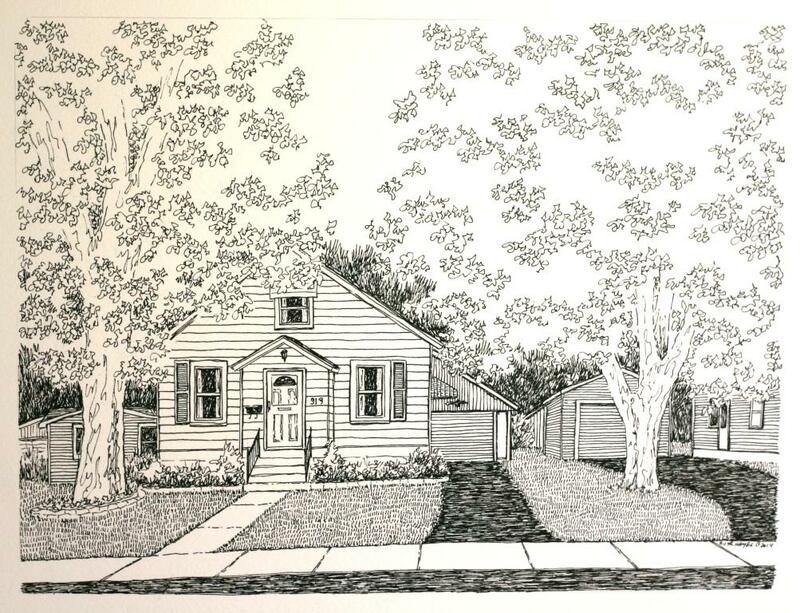 Once, someone had me draw 3 of the same fraternity house and I must say, by the third, I was ready for something else. But 2 won’t be bad. I have both of them drawn and will probably do the inkings consecutively and then the pastels. I want to keep them relatively alike as I go and I think this is the best way. We’ll see how it goes. This is a little bit different in another way too. 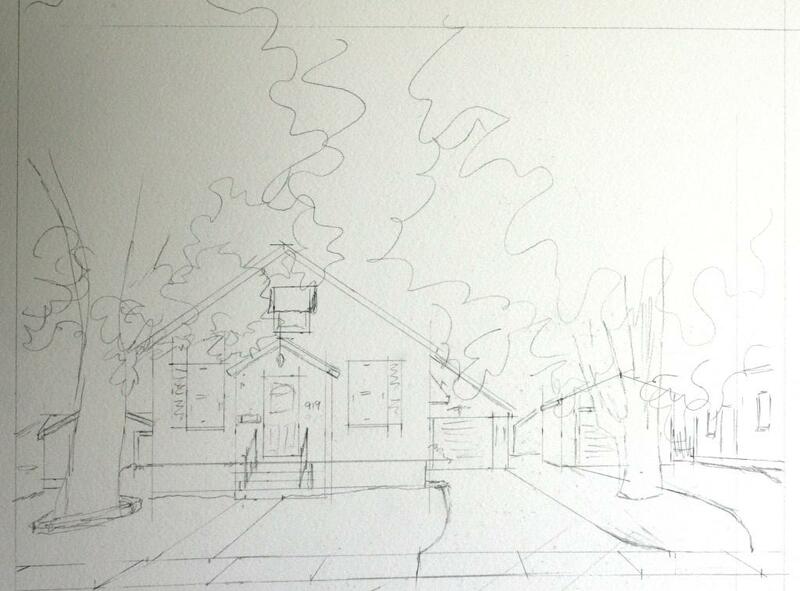 Ordinarily I would concentrate on the house as the main focal point and work from there. She wants both of the big trees along the street in the picture so I have to extend the drawing somewhat. It becomes more of a neighborhood shot with the wider emphasis. We discussed it and she said the right side neighbors were good friends so having some of their structures in it would not be a problem. The house is a yellowy beige so it should present itself nicely amid all of the foliage. 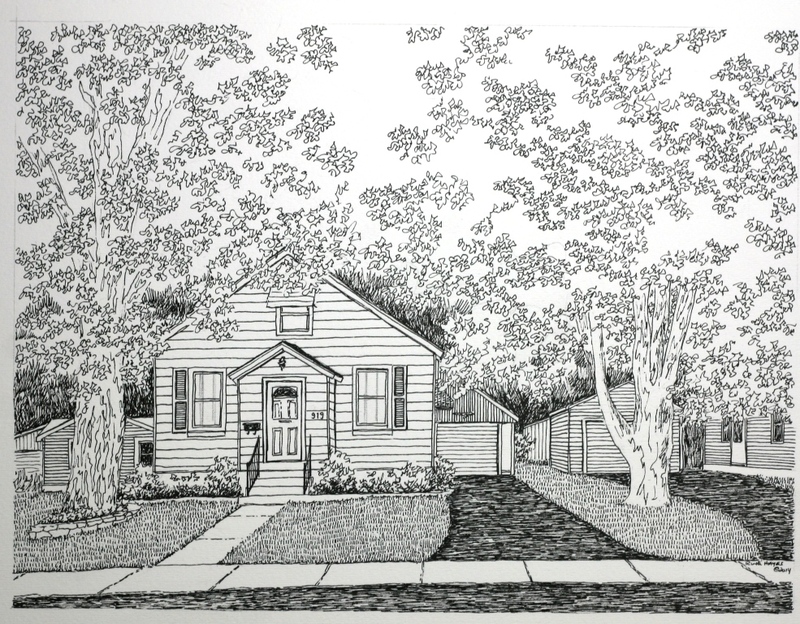 I am waiting to get clarification on the front landscaping before I continue on with the inking. I tend to work from the landscaping in, so I don’t want to do anything else yet. I figure you only need to see one pencil sketch, especially since they are supposed to be the same. 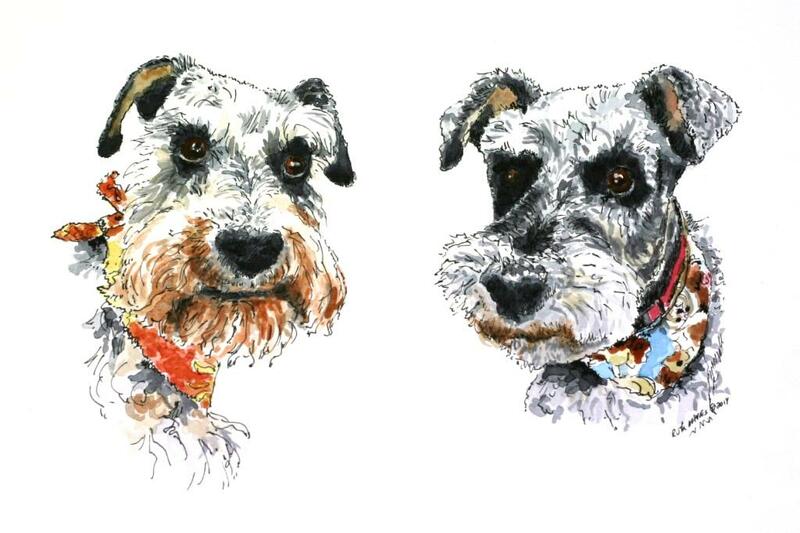 Word came back on the schnauzers and she loved them. I liked them too, especially Zeke. 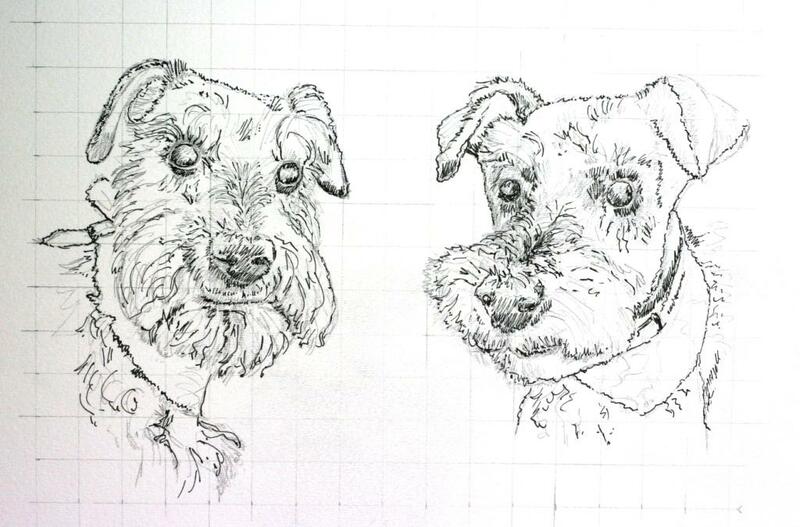 I worked the last few days adding the colors onto Zeke and Ernie, the miniature schnauzers. I took it slowly because I didn’t want to overdo either the gray of the coats or the bronze on the muzzles. That and having my glasses on the end of my nose wasn’t really conducive to long work sessions. I think they both turned out just fine, although I prefer Zeke on the left a bit more. I think he has a bit more character in his expression. I wonder if he is the more opinionated of the two. They sure are cute. I was particularly pleased getting with this order. It is my first return purchaser. She had me do a friend’s pet earlier in the year and came back this fall for her own dogs. Now it’s on to the home portrait up next. 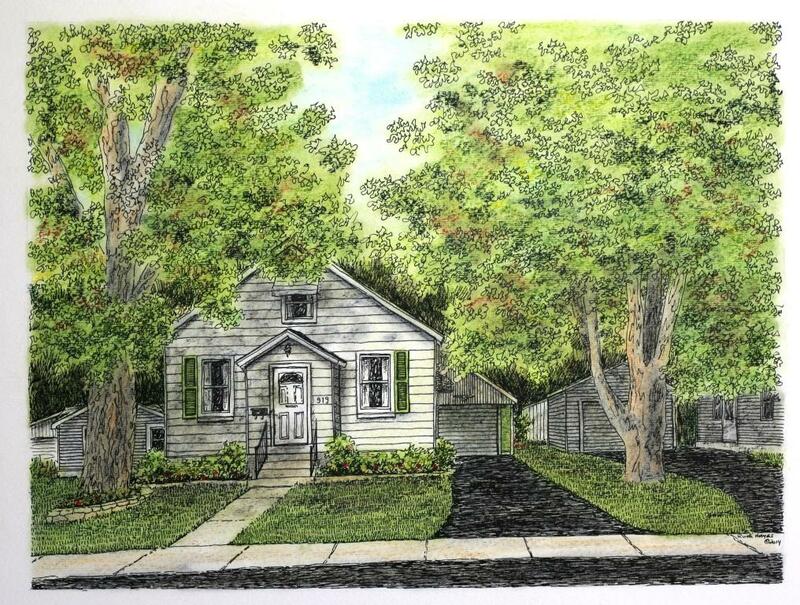 It is actually two portraits of the same house to be given to different family members. I managed to get the inking almost finished a few days ago. Because they have such wiry, spikey hair, I wanted to leave the final inking until after I did most of the watercolors. I don’t want to have them get overly dark and sometimes the best way to accomplish that is to make the final ink touches last of all. I do think that their colorful neck scarves will liven up their grey coat colors and I am looking forward to painting those. I have had to hold off on the watercolors for a few days though. While the drawing was in the rest phase after the preliminary inking, I developed a swollen right cornea and couldn’t see much out of my eye except a big blur. I went to the eye doctor right away and ended up getting some steroid drops for it. We don’t know why it happened, just that it did. I must have irritated it somehow and my contacts didn’t help. It has improved and I can now see okay. Unfortunately, I can’t wear my contacts until I am done with the drops on Thursday and my glasses have to be on the edge of my nose for close up vision. As you might guess, that is not comfortable for an extended period of time. Since I rarely wear them, I never had a pair made with bifocals, plus I can’t find a small enough frame. I would be considered legally blind if I did not have corrective lenses. The current fashionable frames are so huge, with my prescription, I’d look like I had beady little eyes peering out. Not a great look for me. I do think I’ll try to work some later today after the football games are over. Maybe short sessions will work out. I have 3 architecturals in the queue right now so I need to get this finished. It’s going to be a busy fall, which is a fun prospect.